We’re coming to the end of the year, and we’re a little overdue for one of my rants. And this one may surprise many of the regular readers of this blog. While I am a (Donald Trump-voice) HUGE fan of the inbound philosophy, I have to admit that there is a prevailing term (one that I initially thought was a fad) that is driving me around the bend (which I admit is probably not important to you) and harming many sales efforts (which I assume you do care about). The term is inbound sales or inbound selling. Advocates of this idea claim that traditional sales is no longer effective and there’s a need for a new approach to sales. The problem with the term “inbound selling” is that it infers that there’s a difference between outbound selling and inbound selling. The truth is there is no difference – sales is sales and selling is selling. While there’s a difference between bad selling and good selling, the reality is that inbound selling is either just a term to make something old sound new, or it’s something that will actually cause problems to your bottom line. The theory of inbound selling is that as buyers have gained access to more information and don’t rely on peddlers salespeople to educate themselves on issues, opportunities and products, the selling methodology has changed. The truth is that inbound sales is a term coined by HubSpot in 2013 when they announced their first sales-focused tool. For years they espoused the inbound marketing mantra and needed to find a way to unify their message and brand as they invested heavily in sales tools. Since that time, many others have coopted the term, frankly in an effort to create the perception that they’re providing a different type of service or support. Inbound sales is the process of focusing on individual buyers and their personal needs, points of pain, frustrations and goals. As an inbound sales person, it is essential that you prioritize the buyer's needs before your own. Now tell me how this definition differs from the definition of good (or effective) selling at any time since at least the 1970s? Hell, even Tommy Hopkins defined selling as the pursuit to create mutually beneficial, long-term decisions (and he’s about as old school as you can get). Bestselling author Mike Weinberg often rails against the purveyors of “social selling kool aid.” He and I have often gone back and forth about how to best grow a strong pipeline. The point he and I agree completely on is that no matter how good your content is, people are not going to break down your door asking you to do business. 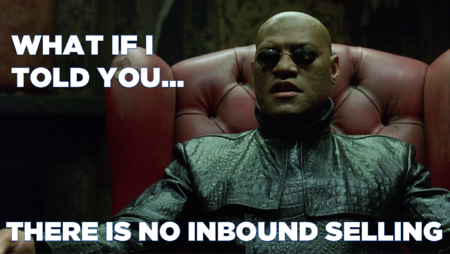 The reason the notion of inbound selling is dangerous is the way it’s positioned. It feels good, because it feels easy. Purveyors use words like the “science of buying” and utilize data to create false arguments that outbound methodologies are dead, and further try to argue that since the buyer is in control (they are) salespeople should only be there to facilitate the order. This is not a new argument - just an old argument wearing new clothes. I remember the 1990s when consultants were selling the idea of “Sales 2.0.” They said buyers should want to buy, so you shouldn’t close. What they forgot to share was that people biologically hate to make decisions - remember decide and homicide both mean the same thing (to kill). Salespeople that struggled were attracted to the message. They thought, “All I have to do is get people to like me and trust me and then they’ll buy.” It felt good, but it killed the very growth muscles that businesses needed to sustain sales growth. And selling organizations have been paying the price ever since. As someone who has studied sales methodologies for almost 30 years, I can attest to the fact that we don’t need another methodology. We already know the methodology that works...and it’s not new. I myself have been practicing it since the early 1990s. In the first phase of the process, the prospect finds you and you find the prospect. It’s in this phase where the world of sales and marketing has changed the most. The means (and importance) of effective lead generation and aligning with how buyers engage and learn is crucial to successful growth. The Zero Moment of Truth (ZMOT) has changed the way sales processes often start, but it has not changed the fundamentals of an effective sales process. If anything, it requires additional skill sets for salespeople to align with and synchronize the buyer/seller interaction. Additionally, the importance of marketing in supporting, enabling and leveraging sales efforts has increased dramatically (hence the popularity and importance of the Inbound Marketing methodology); it has not, however, reduced the importance or the role of salespeople. In this phase, we dig deeper and translate our commercial teaching point-of-view to a series of resonating questions that enables the prospect to learn as much or more about themselves and their situation as they do about your products/services. Just because your prospects have the ability to educate themselves doesn’t mean they are able to apply the contextual knowledge that you have. By digging deeper, your prospect becomes aware of the implications of their problems and the true causes. By reframing the problem, the nature of the conversation changes dramatically and opportunities increase. While many people, including myself, make a big issue about the research surrounding the emergence and importance of the ZMOT (it’s really important), that doesn’t diminish the importance of the first moment of truth. When the problem is fully and mutually understood, there is still a big opportunity to create value. Working collaboratively with your prospect, you work to design the best solution given the constraints that may exist. Unfortunately, this stage is often skipped. In this “request a demo” world we seem to find ourselves in, sales organizations skip the solution design phase and go right to proposal after the problem is communicated. This is a major cause of lost sales and wasted time. It’s also worth noting that this mistake is enabled by many inbound selling approaches. With the message of let the buyer control the process, or the buyer educates themselves, salespeople assume that the prospect understands what they need (and the value of it) and skip important steps. Remember, no matter how educated or intelligent your prospect is, your organization has far more experience (and wisdom) into how to design the right solution. When needs are understood and the solution design is clear, proposals become quite simple, though still very important. In the last phase of an effective sales process, the focus moves to communicating how you deliver the solution and why you’re the best choice to do so. I don’t care what sales methodology you use or what you call it. If it’s effective over a sustained period of time, you’ll see that it follows these four phases. So as long as your sales approach follows these four phases fully, you can call it whatever you want...even inbound selling.